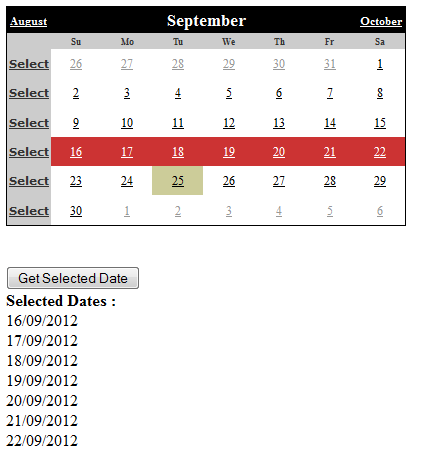 You can select entire week or month in asp.net calendar control and get it's selected dates. You can achieve using SelectionMode property of calendar control. Selection mode property has an enum and it has four selection mode like Day , DayWeek , DayWeekMonth and None. In this example we take calendar control and we set selection mode as DayWeek. When we set this mode after that calender control automatically add one column for select particular week. You can specify "DayWeekMonth" value to selection mode property for select entire month and also specify "SelectMonthText" property to display select text. <asp:Calendar ID="Calendar1" runat="server" BackColor="White" BorderColor="Black"
Font-Names="Times New Roman" Font-Size="10pt" ForeColor="Black" Height="220px"